For some reason, I stayed focused on the skua sitting on the water, I had a weird feeling something insane was about to happen. 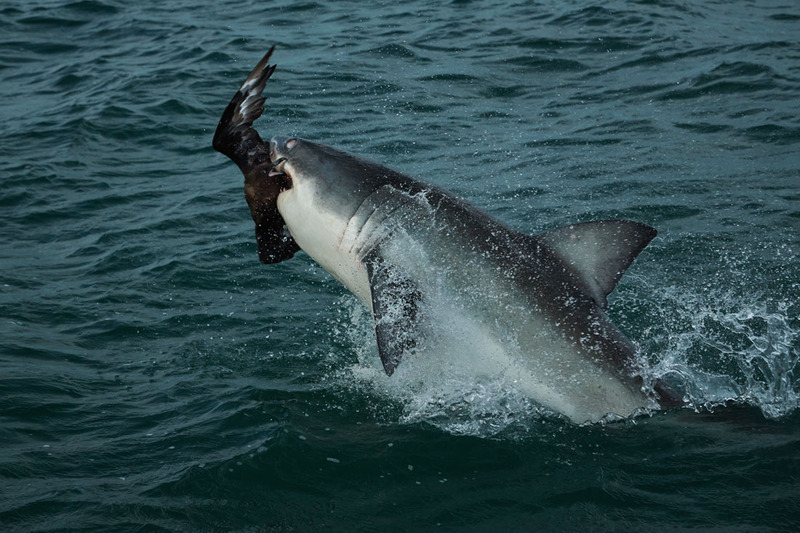 Just as my finger came off the aperture dial (I opened up to compensate for the black bird) the shark blasted out the water. My finger quickly found the shutter and pushed down so hard I thought surely it would break. Miraculously, in between the mirror flapping up and down, I saw the bird fly out from the shark’s huge splash down. All of us onboard went ballistic at the bird’s narrow escape. High fives all around when I brought the image up on the camera screen and confirmed the shot. Maybe the shark didn’t have a solid bite or maybe it was the skua’s fight back that caught it by surprise. Later that night we noticed as we processed the image on the big screen that besides the shark having the skua in its mouth, the skua, in turn, had the shark in its beak. Hunter became the hunted?!. From take off to splash down, 11 frames were shot, the drive is 5 frames a second which equates to the strike being over in around 2 seconds. Sheets, lines and a ton of rope.